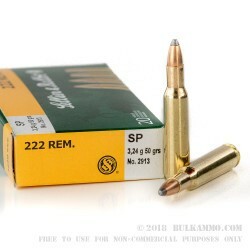 A classy round, 222 Remington ammo; this is a nice version of this venerable flat shooting round that works as well today on varmints as it ever has. It works as well today for varmints as other mainstream calibers suited to the hunting pastime. The flat shooting trajectory and the swift velocities that push this projectile out through and past wind drifts to achieve 400 yard + accuracy has made this round something special in the hearts and minds of many shooters, especially plains area shooters. 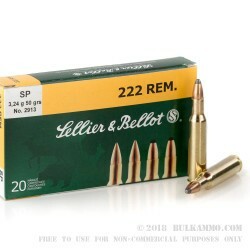 This Sellier & Bellot 222 Rem ammo featured here is a 50 grain soft point projectile loaded into a brass cartridge casing with a Boxer primer and a nice set of static ballistics. The accuracy is enhanced by the speedy 3215 feet per second velocity out of the end of the barrel and the 1148 ft. lbs. 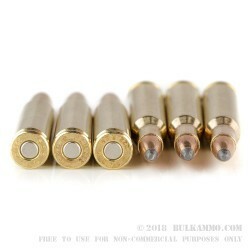 of energy delivered at the muzzle makes for a versatile cartridge for intermediate game and gives better performance than most standard .223 Remington for most varmints due to the wind shedding capabilities of the projectile. It is otherwise quite similar. 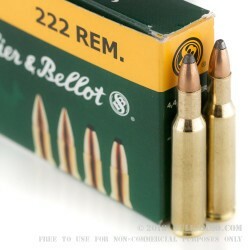 20 rounds of .222 Remington ammunition by Sellier & Bellot.